Captchatunneling is needed only if our service is not integrated with your software. If you have software of your own then please look into our API section. 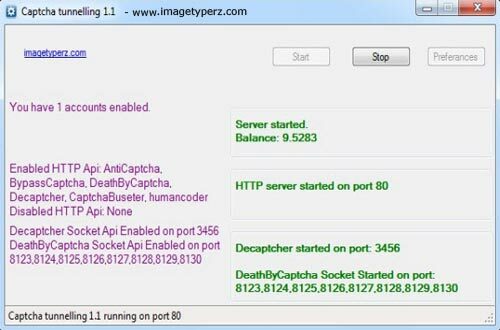 Excellent integration of captcha decoding API like death by captcha api, bypass captcha, decaptcher service , antigate or anti captcha with software's is very simple here. These are accessible 24*7 with human based deciphers have a very low price for the service of anti captcha. Just few easy steps and instructions before you get started with integration which includes some formalities for registration and a few easy downloads. This will help in answering your entire question as to how to use bypass captcha, how to use decaptcha service and also how to use death by captcha. All of these are fantastic captcha breaker and captcha solving service activated here with simple integration via the captcha tunnelling. Captchatunneling is needed only if our service is not integrated with your software. If you have software of your own then please look into our API section. There are various Application Programming Interfaces like the ones from bypasscaptcha, decaptcher, deathbycaptcha, antigate or anti captcha which can be supported by our services. In case you have any other non supported API's or software's, then barring you from sidestepping captcha is sure, unless you have .netframework 2, .netframework 3.5 and admin rights to operate captcha tunnelling. Excavating the right captcha text in future is only possible on integration with your api. Our service supports bypasscaptcha API, decaptcher API, antigate or anti captcha in addition to deathbycaptcha API. You need .netframework 2, .netframework 3.5 and admin rights to operate captcha tunnelling. First run our captcha tunnelling before starting your software. Register an account in www.imagetyperz.com and credit your account. 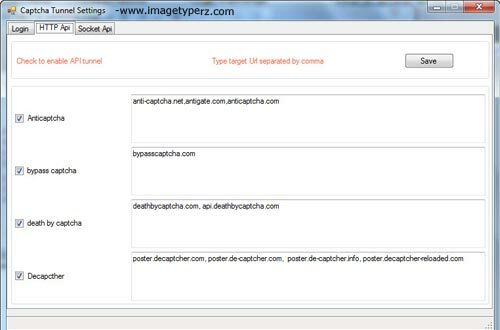 Captcha tunnelling can be downloaded from http://www.imagetyperz.com/api/new/imagetyperz.zip set it up on your system. Type your Imagetyperz username and password and save it. 3) A list of services for decaptcher or antigate can be found in HTTP API. Please Allow any one which is available in the software. For example If your software is incorporated to antigate service alter the antigate check box as well as save it. The server on HTTP is underway on port 80 as well as For socket Application program interface enabled or not enabled note as per your option. NOTE: Enable any one service integrated with your software. Don’t enable all services. For socket API you can specify the no of threads that you are going to use. Just choose from the box the number. Note: you don’t need account with credits in antigate or anti-captcha to use tunnel. You can use any antigate or anti captcha free account or some random username and password. You need credits only with our Imagetyperz service as all captchas will be redirected to our antigate or anti captcha service.